So what is Pilates Reformer? These private and semi-private classes feature of a combination of movement on a Reformer machine with great attention paid to form to maximize the benefits of the movement. Each exercise is designed to challenge and strengthen the body. 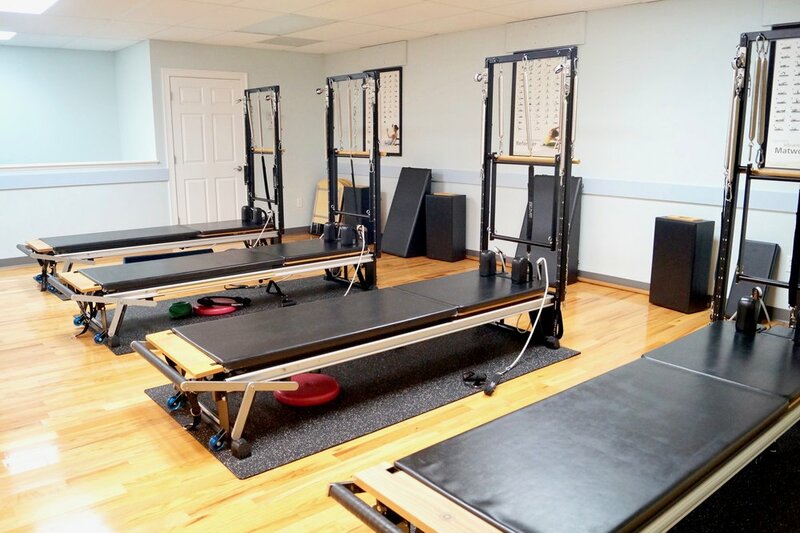 Our upstairs studio is fully equipped with four STOTT Pilates Reformers, giving each class member personalized time with the instructor during their session. The benefits of this Pilates Reformer are endless, and will leave you wanting more. A full body workout. Rather than traditional mat pilates, Pilates Reformer is working the rest of your body through a range of movements targeting groups of muscles in your legs, arms, and shoulders. Small classes. At our studio , the maximum number of students per class is four. We offer two-person and private sessions as well. With this focused group or private workout, you’ll receive direct attention from the instructor, offering constant guidance and motivation through each session. Improves flexibility. Through deep stretches and slow transitions between controlled movements and balance on the Reformer, your muscles will strengthen and your posture will increase, but most of all your flexibility will transform. Flexibility is vital for your overall health and fitness, and will advance your fitness levels and prevent you from injuries in an active lifestyle. Increase your weight loss. Pilates Reformer can be a valuable addition to your weight loss regime by increasing your strength and boosting your metabolism. It will continuously challenge and shock your body to spark positive change in your fitness journey. Low impact workout, with high intensity. Pilates Reformer uses springs, straps and the carriage on the Reformer, offering a low impact fitness option, perfect for those recovering from an injury. As you lay on the carriage for your workout, you will take any pressure off weak or damaged knees and ankles. If you’re looking for a private or two-person class, or just need a different group slot, try to Schedule a Different Session here online, or contact Susan for more information.